It is a little over a month until the holidays. I am not going to suggest a Phoebe doll, because any orders received at this point, I cannot guarantee an Xmas delivery. I have a number of dolls in the works that will make it to their new homes, so if you've already ordered, you don't need to worry. However... it is not to late to order the perfect gift for teaching your child or grandchild to sew: The Scrappy Phoebe Learn to Sew Kit. The kits comes with a 12 inch Scrappy Phoebe doll, an instruction booklet detailing how to sew and embellish the basic dress and everything you need to make at least eight dresses, including practice fabric, 8 fabrics, 8 trims, velcro closings, Wonderclips and pattern pieces to be traced onto fabric and cut. Everything is packaged in a cute box for storing when your little one is not sewing. I just cut some fun fresh new fabrics for the kits. The dresses and instructions are simple and a great starting point for sewing. "I wanted to thank you for the amazing learn-to-sew kit I purchased for Christmas. Both of my girls (ages 7 and 12) have been making fashions for Phoebe - adapting the pattern for a long sleeve dress, a flannel nightgown and a felt coat "
Kits available in my Etsy shop. 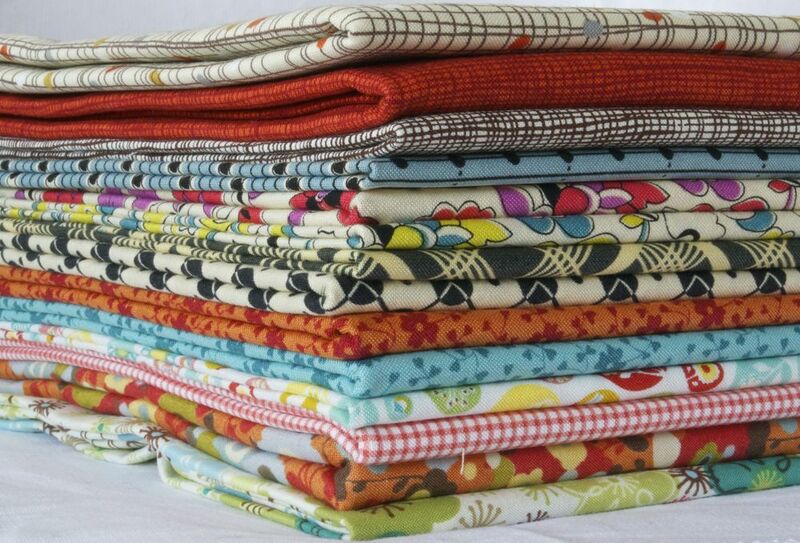 New stack of fabrics for the kits! Wool felt is one of my favorite fabrics to work with. It is soft, yet crisp. Comes in many beautiful colors and it isn't hard to find. So a few years back when the book "Big, Little Felt Universe" by Jeannette Lim came out I bought it for my 10 year old. It had about 50 projects, all everyday items made with felt. A felt lap top, a little felt lipstick. A felt campfire complete with s'mores. All things she made that first year and all things that adorned her room... until this past year when she was officially a teenager. The felt campfire set and lipstick are gone. However the book and her felt scraps are here to stay. This past week, we entered a new felt phase. Felt veggies (all of the photos here were made by my 14 year old). 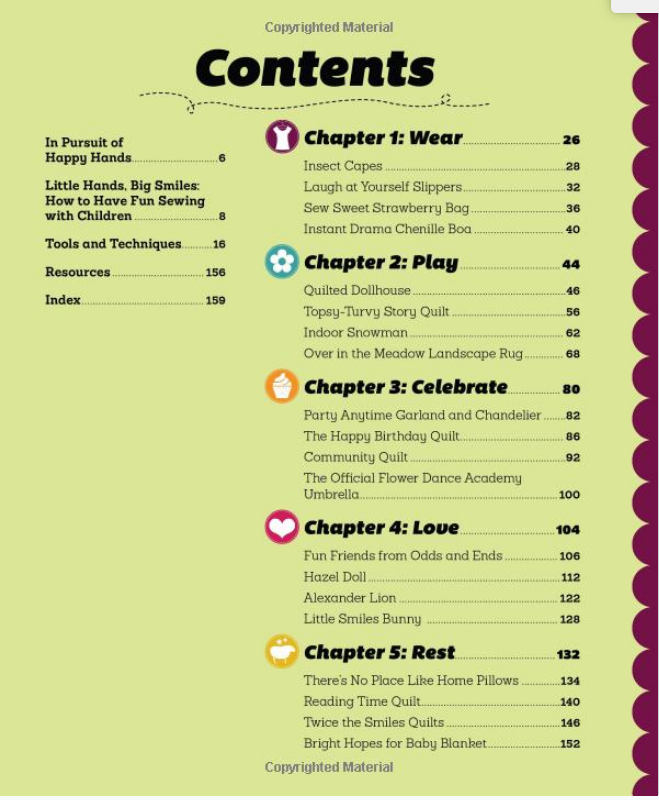 This book is perfect for the child that sews. The projects, ability and age range are broad. The directions are great. And as we head into the second month of summer vacation, who doesn't want a project your child can happily work on mostly on their own. The book recommends using a felt wool/ acrylic blend. This type of felt can be found easily on Etsy and in fabric stores. I am giving away one copy of "Big, Little Felt Universe" by Jeannette Lim. 1. Leave a comment on this post. You must fill out your email in the comment form or in the comment. Without an email, you are not entered..
2. I will select a winner using a random number site in two weeks. 3. If the selected winner does not respond in five days, I will reselect. 4. I will not pay postage to send the book outside of the lower 48 states. So sorry. Last December, a Phoebe&Egg customer emailed me asking if I would make a doll dress from a fabric she had purchased. She had purchased the fabric in Liberia, a country that by the end of 2014 had endured over 9,000 cases of Ebola. Sadly, nearly four thousand of those patients died. She had been in Liberia for several months. She was one of the many brave medical workers who headed straight into the vortex of a dangerous expanding crisis. I was in awe of her bravery. Last fall, Liberia was declaring a shortage of body bags. Last week, Liberia was declared Ebola free. Ebola has receded from the headlines, but none of us should forget those who bravely went to west Africa to control what seemed only a few months ago uncontrollable. When my customer returned to the United States and her family, I received the fabric and a photo of the dress she had in mind. The fabric was beautiful, a very bright crisp African cotton. The dress she requested was beautiful and looked simple. The dress design, sleeveless with a ruffled collar, was from Malaika Designs, a socially conscious clothing company. Before cutting the fabric, I made a test dress first. I made my standard one piece lined dress with a ruffled collar sandwiched between the dress fabric and the lining. Ugh. Not good, at all. The ruffled collar did not fall correctly. In fact, it did not fall at all, it stood straight up. Next I used a ruffler to evenly pleat the collar ruffle and tried hand stitching it to the finished dress . The collar now fell correctly, but seemed too small compared to the photo from Malaika designs. It was just not African enough. Next I made a wider collar, used the ruffler and hand stitched the ruffle to the outside collar edge. I was happy, more than happy, I was smitten. I loved this little dress style on Phoebe. I went ahead and cut into the fabric and began sewing. The doll modeling the dress was also purchased. “The doll will be named after one of my patients who did not survive, but battled the disease so hard.